You've discovered your computer has an issue, and it is a Hard Drive Issue, or your external Drive doesn't work! You have data on it that you need and haven't baked up, what are your options. PANIC! now that you've calmed down give us a call! Depending on what has happened we may be able to recover your data in our Plymouth Workshop, if the Hard Drive is physically damaged like the one in the image (one of our customers) then we would send it away to our partner company. Because we don't have a clean room to take the drive apart, or the equipment or spare parts to get the drive to a state the data could be recovered. Of course you could just send it away to a company you have found online, and there are a lot of them around. 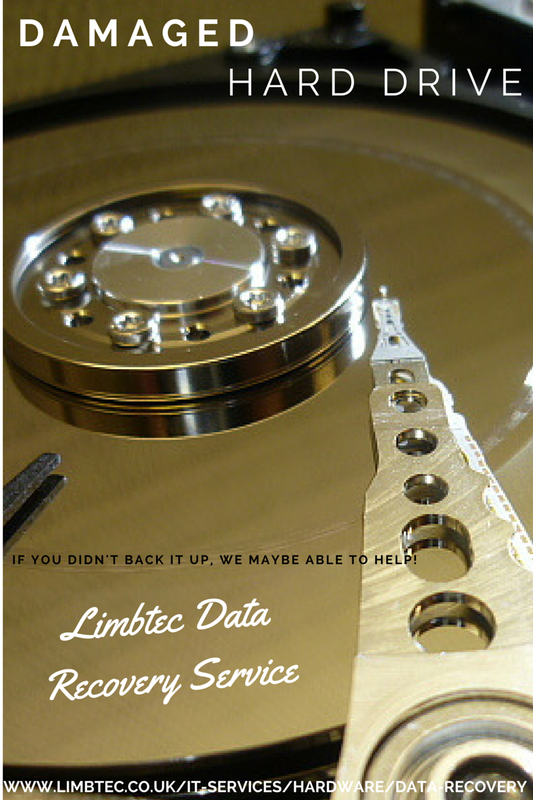 The drives we can recover from in our Plymouth Workshop will be worked on, and as much of the data as possible will be recovered, and then returned to you either on a new Hard Drive or a USB memory stick. And after all this don't forget to resolve your problem on not backing up in the first place. Computer running slow? Upgrade it today! Is you computer running slow? Perhaps you've run out of storage space? One of the big issues with how we use computers these days is that they start running slow, sometimes within weeks of purchase! Generally it is either because the spec of the computer wasn't right in the first place, or you have ran out of resources. Normally you have run out available memory due to the programs you are running. Or you have filled your hard drive with all your pictures and videos. Simple answer and relatively inexpensive solution is to have your system upgraded, so some more memory added, or your hard drive changed to a much bigger one. With the Hard drive we can even clone the old hard drive so your system will be exactly as it was before the hard drive change. Even better this week until 12th June we are giving you a 10% rebate on the total charge of the upgrade. Call 01752 546967 or visit http://limbtec.co.uk/it-services/hardware/upgrades for more details. With the cost of Computer equipment (Desktop, Laptop, Notebook, tablet etc..) dropping all the time, is it worth getting it repaired if you damage your device? needing a board repair, almost certainly not! We had one recently like the example above, and with a repair bill running to around £160, and it approaching 6 years of age, then it just wasn't worth it. In this case the customer put the money towards the cost of a new laptop. However if it had been his screen needing to be replaced it might have been worth the cost of £100. When a computer needs to be repaired then we will diagnose the fault, and then come back to you with a cost to repair it, and only when you agree to this do we carry out the repair. You may well be tempted by all those cut price offers that you see from computer companies but, there is a great deal more to the cost of running a PC or network than the initial price tag. Of course you may feel that you don’t need an adviser from the outset and that you can handle the technology yourself. But if there is any doubt in your mind about this at all it might be wise to reconsider. One good way to think about this is to make a rough calculation about how much your own time is worth. If you, as an owner-manager, hope to take out £50,000 a year in salary then a week of your time is worth roughly a £1,000. Working out how much your investment in IT will save you is not easy, as it varies from business to business. Here is a rough guide to making your calculation and with a little effort you should be able to get some reliable figures. Firstly look at what you have in place today, how much that is contributing to the business and how much it is costing you. You then need to look at how much less time you will have to spend managing IT and keeping them up and running. Finally, you need to factor in the capital cost of the equipment. Let us for example, say that you have 10 staff working on desktops that were purchased three years ago. On average these staff costs are £10 an hour and they work 40 hours per week; that’s 400 hours per week and a total labour cost of £4000. Let’s assume that buying 10 new PCs and Office software will give you a 5% increase in productivity. This is an arbitrary figure but you are bound to get some improvement, as the new systems will be faster and have improved functionality, this figure can increase if your original computer equipment is older than 3 years and if you purchase more powerful PC systems. That 5% would be worth £200 per week, or around £10,000 per annum so that’s a pretty good start. You will need to add into this the savings from your time, involvement in research £1000, supporting your staff on minor issues such as email and printing problems, this will be handled by remote support. Assuming you spend 2 hours per week helping staff this will equate around 12.5 days per year £2500. Then there’s peace of mind not having to worry about down time. You can look at other costs to, reduced maintenance, software licences savings and reduction in the amount of equipment you require, i.e. number of printers, servers etc. You then need to calculate these savings multiplied by the presumed lifecycle of the systems. In simple terms, assuming a saving of £13,500 per annum, the improvement will be worth £40,500- this will outweigh the initial cost of the upgrade and probably pay for itself within a year. This is why it is worth looking in detail at the cost-reduction and life-cycle feature of systems when you buy them. At the power saving, reliability features, at warranty terms and conditions. The overall savings you will make will be much greater if systems cost less to run and deliver better reliability and performance. How costly is it for your computer systems to be down? Another question to ask yourself is how much does it cost if your systems aren't working properly? It's for this very reason why we monitor our business customers computer systems. There is still a possibility that something catastrophic could happen, but with our monitoring having eyes on your systems 24 hours a day, it is less likely that something thatmight cause problems happens. Why you should monitor your computer network? Like it or not your IT network is a key part of your business, even if you only have 1 computer, chances are, you use it for your email, checking the web, placing orders, storing documents ………. The truth of it is that these complex pieces of equipment are just basic tools for business in modern times. So you need these tools to be ready and able to work, when you want them to, and not in their own time. You will also want to make sure it is protected, and so is the data on your computer (Server or Network). All of this would take time, and knowledge. Is this the best use of your resources? We would recommend all of this is monitored, 24 hours a day 7 days a week, and yes you guessed it 52 weeks a year. Enabling the little issues being caught early on then they can worked on before they become a bigger more serious problem, leading to down time. But more than monitoring your Hardware, and event logs, items such as backup can be monitored to ensure your backup has been successful, and that your antivirus signature updates are up to date. How about your windows patches, are they done, and then your other software, are they all up to date? And lastly some simple maintenance that should be done, but are you sure it is being done? Leaving you to get on with your business, and not having to worry about the tools enabling you to do this. There are numerous FREE internet security software packages out there, but are they enough to protect your computer (or device)? They might be, but the threats are coming in from an ever increasing number of ways. Although most free products do offer a good range of protection against viruses, they don’t necessarily protect you from item such as boot sector viruses, or malware. They may or may not have additional items such as firewalls, parental controls, or content filtering. But that may be OK for basic use. If you are a business then most of the free versions out there aren't able to be used legally in any case. Does it protect you from browser hijacking, and other Malware which is becoming more frequent on the internet today? 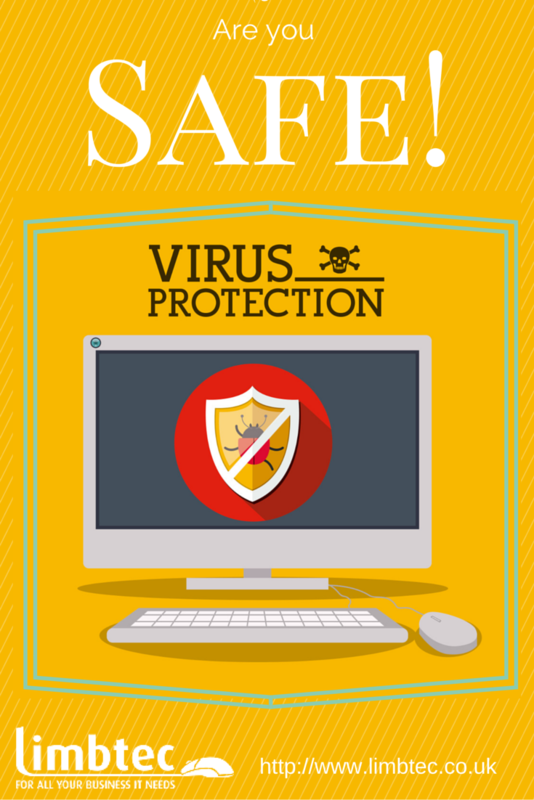 We have seen extremely good results in our Managed Anti-Virus, you still get a software package (Fully Featured) installed on your computer, but because it reports to a central panel on the internet, we can be alerted to the fact you have a virus, and if the system has managed to clean it for you! If it hasn't we can clean it for you (sometimes remotely), we can even tell if it hasn't been updated for a while, this is useful as one of the first things a Virus should do is to try and stop your anti-virus from working! Don’t Worry it isn't some dodgy software either it is AVG Cloudcare for more details visit http://www.limbtec.co.uk/it-services/hosted-services/anti-virus or call us on 01752 546967. While using Windows 8.1's new interface in a traditional way might require some time to accommodate, the tasks of navigating through the operating system and its new apps can be simplified by using the keyboard shortcuts that Microsoft has made available. The shortcuts shared in this article were chosen by us while thinking what apps or settings you might access or use on a regular basis. They are simple enough to be easily grasped by anyone and they will help you be more productive in your daily tasks. Windows Key = The action for this key depends on where you are when you press it. If you are on the Desktop when you press it, it takes you to the Start screen. If you press it again, it takes you back to the Desktop. But, if you press it while in a Windows 8.1 app, it takes you to the Start screen. Press it again and it takes you back to the app. Ctrl + Tab = When using it on the Start screen, it switches between the Start screen and theApps view. On the Desktop it does nothing. However, some web browsers will have the same shortcut for switching between tabs (e.g. Firefox) or for creating new tabs (e.g. Internet Explorer 11). Windows Key + type an app name = When using it on the Desktop, it takes you to the Startscreen and searches for installed apps using the name you typed in. 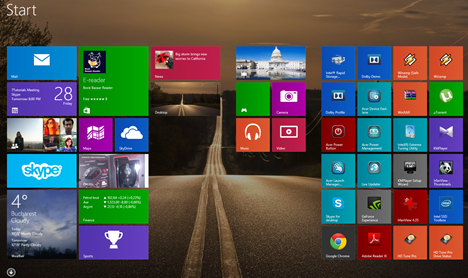 When you are on theStart screen, pressing the Windows Key takes you to the Desktop. There you should only type the name of the app you want to use. Escape - When using it on the Start screen, it closes the Start screen and switches to Desktop. This shortcut does nothing when you are on the Desktop. Windows Key + E = Launches File Explorer both from the Desktop and the Start screen. Windows Key + R = Launches the Run dialog that you can use to run programs or commands. Windows Key + X = Launches a hidden menu with many useful shortcuts. This menu is also named the WinX menu or the power user's Start Menu. Windows Key + L = Locks your Windows 8.1 PC or device and takes you to the Lock screen. Windows Key + P = Opens the Project sidebar for extending your image to a second screen. If you have multiple screens or if you are using a video projector, this sidebar allows you to choose how the image should be displayed. You can keep the image on one screen, duplicate it, extend it to another screen or only display things on a secondary screen. Windows Key + F1 = Launches the Windows Help and Support documentation provided by Microsoft. Windows Key + C - Displays the Charms bar. You can navigate through the charms with the arrow keys on your keyboard. Windows Key + Q = Launches the General Search. You can use this to search for files and settings on your PC, the Internet, and OneDrive, as well as through installed apps and theWindows Store. Windows Key + F = Launches the Files Search. You can use this to search for files on your PC and OneDrive. Windows Key + W = Launches the Windows Settings Search. You can use this to search for specific operating system settings by typing in certain keywords. Windows Key + I = Displays the Settings charm. When using it on the Desktop, you can use this charm to access the Control Panel, Personalization options, the System information section and the Windows Help and Support module. You also have access to the wi-fi settings, volume and brightness control, notifications, power buttons and keyboard settings. When using it from the Start screen, you can use this charm to access the Start screen personalization options, tiles settings and the online help version for the Start screen. You can also use it when working with Windows 8.1 apps to access their settings. Windows Key + H = Launches the Share charm. When using it on the Desktop, you can use this charm to share a desktop screenshot through the Mail app or other social network app that you have installed. When using it on the Start screen, you can use it to share a screenshot of the Start screen through the same channels. You can also use it to share data from Windows 8.1 apps that you are running. Windows Key + K = Displays the Devices charm. Depending on the peripherals you have attached to your computer or Windows 8.1 device, you will have the option to play multimedia files, print information from modern apps or show the information on your screen on another display or video projector. This charm can only be used in modern Windows 8.1 apps. Windows Key + Z = When using it on the Start screen, it displays the Start screen customization button at the bottom of the screen. When using it in modern apps, it displays different contextual options for each app. Alt + Tab = Repeatedly pressing the Tab key while holding Alt pressed cycles through open windows and apps. Release the Tab key on the window or app that you want to open. Windows Key + Tab = Repeatedly pressing the Tab key while holding the Windows Keypressed cycles through open modern apps while displaying them in a vertical sidebar at the left side of the screen. Release the Tab key on the app that you want to open. Ctrl + Alt + Tab = When pressed together, this combination of keys displays the list of open windows and apps and keeps the list on screen even after you release the keys. You can then navigate through open windows and apps using the arrow keys. Ctrl + Windows Key + Tab = When pressed together, this combination of keys displays the sidebar of open apps and keeps the sidebar on screen even after you release the keys. You can then navigate through open apps using the up/down arrow keys. Windows Key + Arrow Up = When using it on the Desktop, it maximizes the current window across the screen. If the window is already maximized it has no effect. Also, it doesn't work on the Start screen. Windows Key + Arrow Down = When using it on the Desktop in a maximized window, it restores the current window's size. Pressing it again while the window is restored causes the window to be minimized to the taskbar. If the window is already minimized it has no effect. Windows Key + Shift Key + Arrow Up = When using it on the Desktop, it maximizes the current window vertically. Windows Key + Shift Key + Arrow Left/Right = Moves the current window to the left or the right monitor. This works only when using multiple monitors. Windows Key + Arrow Left/Right = When using it on the Desktop, it moves the current window to the left or right half of the screen. Pressing Windows Key + Arrow Left while the window is at the right of the screen, for example, restores the window. Pressing the combination again moves the window to the left half of the screen and vice versa. This can be used across multiple monitors. 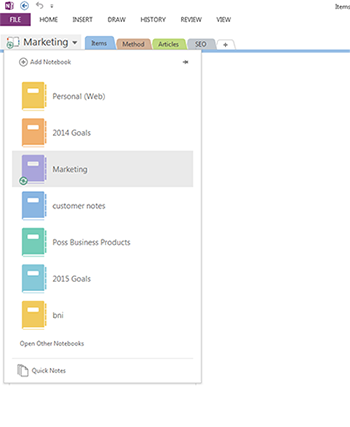 Alt + Space = When using it on the Desktop, it launches the title bar menu of the current window. You can also access this menu by right clicking the title bar of the current window. The menu generally includes options to resize the window and other application specific options. Using this while on the Start screen has no effect. F11 = When using it in desktop applications that are part of Windows 8.1, like File Explorer orInternet Explorer, it enables or disables the full screen view for the current window. Some third-party applications might support while many do not. Windows Key + T = When using it on the Desktop, it highlights the first application in the taskbar. You can use the arrow keys to cycle through the taskbar applications. The applications that are running also display a thumbnail above their icon when you select them. Windows Key + B = This works both on the Desktop and the Start screen. If the Notification Area Icons are set to "Always show all icons and notifications on the taskbar", this keyboard shortcut highlights the first application in the system tray. You can use the arrow keys to cycle through all the applications found in the system tray. If the "Always show all icons and notifications on the taskbar" is disabled, this keyboard shortcut highlights the "Show hidden icons" arrow. You can then press Enter to display the hidden icons or use the arrow keys to cycle through the applications found in the system tray. Shift + click on a taskbar application = Launches a new instance of the selected application. This works only with applications which support running in multiple instances, like Microsoft Office or Internet browsers. Ctrl + Shift + click on a taskbar application = Launches a new instance of the selected application with administrator rights. This works only with applications which support running in multiple instances, like Microsoft Office or Internet browsers. 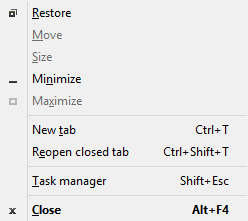 Shift + right click on a taskbar application = Launches the contextual menu for that application instead of the list with recent items or pinned tasks or folders. Windows Key + number keys 1 through 9 = Launches the taskbar application at the specified position. We tried to share a selection with the most useful keyboard shortcuts available in Windows 8.1. We didn't give you everything, only those that you are more likely to consider useful when using this operating system, its apps and features. I have had the intention of using One Note more for a couple of years, but always revert back to the trusted pen and paper. However it is now becoming harder and harder to find the note I wrote many years ago. So before Christmas I checked through the various options I had to store note going forward electronically and in the cloud. And there are many good products out there, but I have One Note on my phones, on my tablet, Laptop and Desktop so it was a no brainer to choose this as my app. Method, a quick reminder of how, and where to market. Article, with a page for any articles to write, or copies of interesting article I had found as a source of some good articles. SEO, place to put SEO articles of use. Other Notebooks are more fluid than this one, Customers Notes, are used and amended on a daily basis, and the BNI notebook is accessed and altered at least weekly. So far, and a month into using this system it's working. Although I am still a work in progress, and often find myself reaching for my trusted notebook and pen to make notes. Luckily so far I have managed to then add these to the relevant notebooks. Best thing is no matter where I am I have access to these notes, and have used them several times remotely to get access to data I need when a client calls when I'm away from my desk. I will revisit this article in months to come to keep you updated of how I manage to use the system, and if it replace the grabbing my notebook as my reflex action.